Märklin produced several forms of track for their 00/H0 scale trains since their inception in 1935. 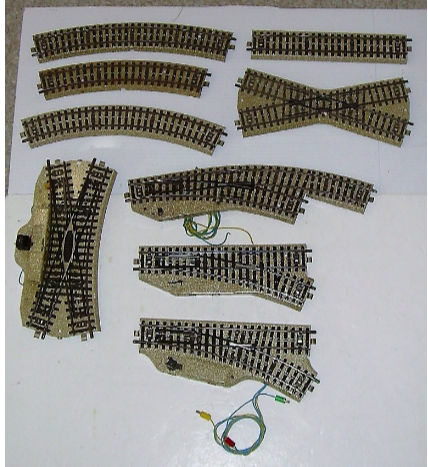 This track is a “three-rail” system (the inner track, solid or stud, providing the power and the outer track providing the return, just like the old Märklin or Lionel 0-gauge track. In this article we explore an overview of the various track offered by Märklin over the course of its history. 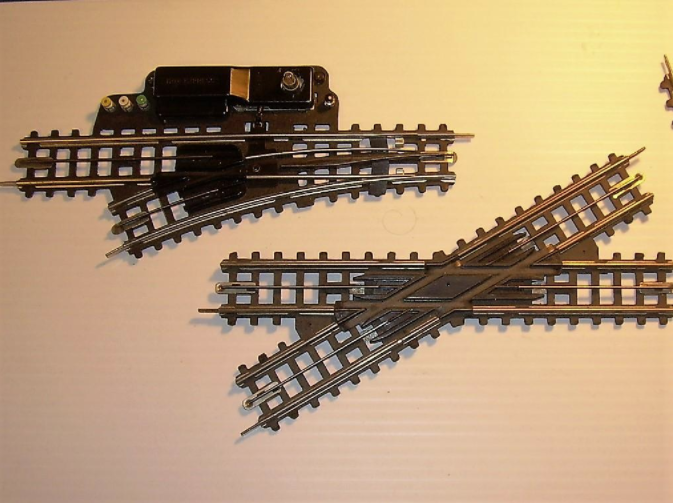 The 00/H0 track forms differ significantly from each other but can be used together on the same layout with and sometimes without adapter track. 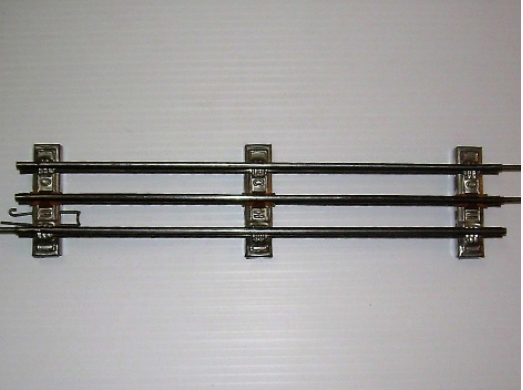 A somewhat similar metal three-rail track system was produced by Hornby for their 00 trains, which ran on DC power. 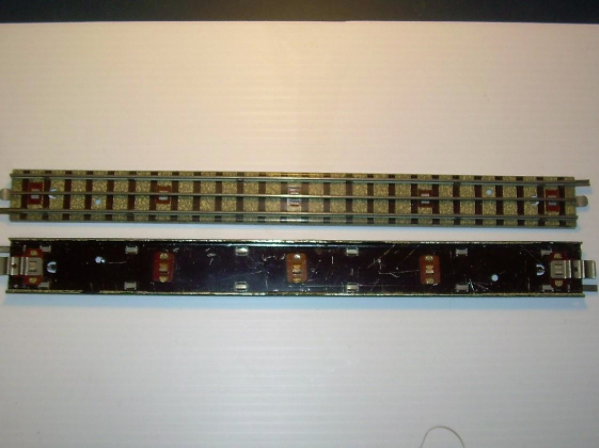 The German Trix firm also used a 3-rail track system for their DC operated trains, whereby the outer (return) rails were insulated from each other being fastened to a black cardboard base thereby allowing 2 trains to run simultaneously on the same track. 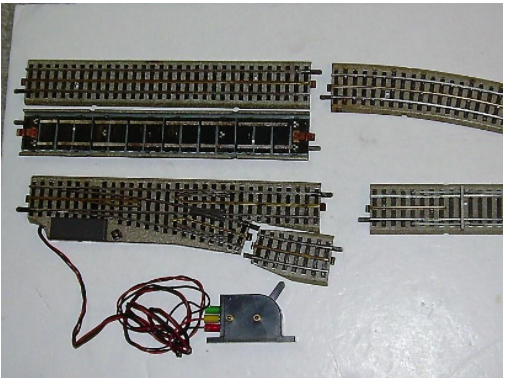 Märklin’s different 00/H0 track forms are discussed below. When Märklin introduced their first “00” trains in 1935, these trains ran on track with a metal roadbed, a distance of 7 mm between the painted ties and a tubular middle rail. Between 1935 and 1947 these 3600 track pieces were produced with minor variations. The roadbed and material used for the middle rail, colouring, etc. changed often due to paucity or lack of raw materials before and just after WWII. The beige colored track below was produced from approximately 1946 – 1947 when the lithography materials required to print the roadbed on the track were scarce. This track is known as “PX-style track” because the sets containing this track were sold in Postal Exchange (PX) stores to US soldiers. The track system included straight track (18 cm. long), curved track with a circle diameter of 72 cm, (twelve track pieces forming a circle), manual and electromagnetic switches and a crossing track. NB: the length of each straight track piece of 18 cm is one-fourth of the circle diameter of 72 cm. 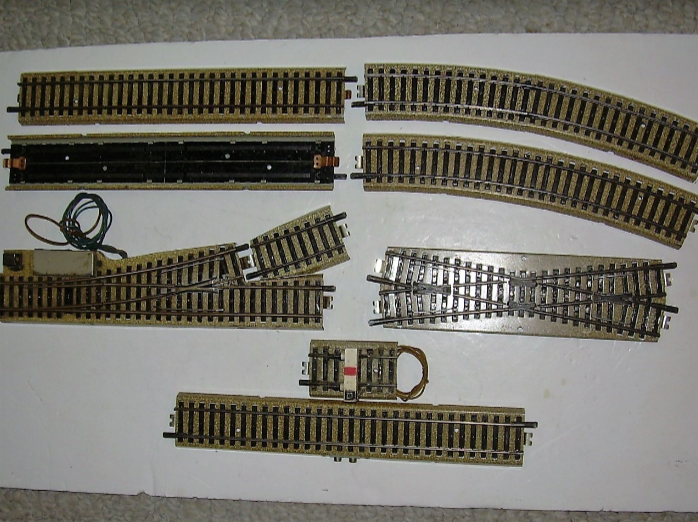 This configuration has been maintained by Märklin from the first 00 track until today. In 1947 Märklin improved their 3600 series tracks by spacing the ties much closer at 4 mm. This track system lasted until 1958. There are several notable variations within this track system. Initially the outer rails were blackened solid brass, later hollow. Also the paint scheme of the underside of the tracks differed, especially as there was a shortage of available paint in the earlier post-war years. The system included straight track (18 cm), curved track with 12 track pieces form a circle of 72 cm radius, manual and electromagnetic switches, a double slip switch, a crossing track and set of wide radius curved track numbered 3700 (12 track pieces form a circle of 91 cm). The electromagnetic switches initially had a single solenoid, later a double solenoid for operation. From the French firm Vollon & Brun, who produced beautiful 00 trains, Märklin purchased the license for their track. The French track consisted of plastic ties embedded into a metal roadbed and had a solid centre rail. In 1953 Märklin came out with an improved version of this system: for the first time the “stud-contact” system was introduced. The track consisted of solid blackened brass rails, black plastic ties embedded in a metal roadbed and very small stud contacts protruding through the plastic ties, similar to the later K-track system. The straight track was 22 cm long. Sixteen curved track pieces formed a circle (117 cm. diameter for the #3900 series curved track and slightly smaller for the #3800 series curved track). 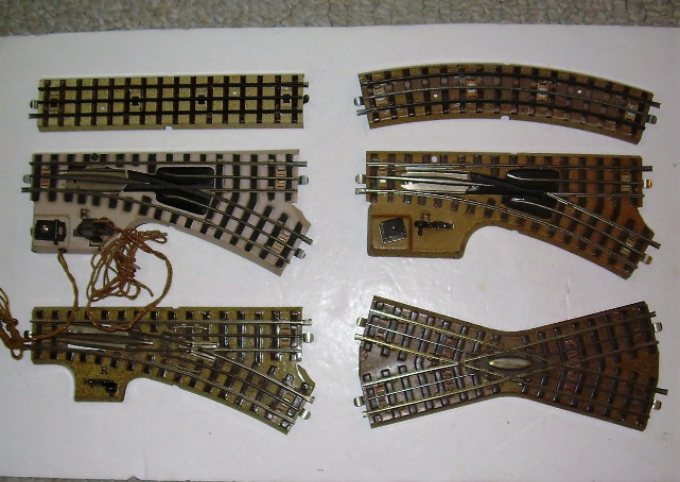 Electromagnetic switches and a cross-over track were sleek, and bumper track pieces had light. The colour of the metal roadbed is slightly yellowish and different from the later M-track. The track was very labour intensive to produce and was therefore rather expensive. It was offered together with the existing 3600 series track and did not sell well. Besides, the locomotives had to be adapted with a special pick-up shoe. The first “ski pick-up shoes” were introduced because the old tongue (or spoon) pick-up shoes could not run on the stud-contacts. The new ski pick-up was perfectly flat, and ran smoothly over the stud contacts. Märklin’s flat tongue pick-up shoes on a T 800 locomotive. This style pickup could not run on the stud-contact style track. The “Model-gleiss” track system was discontinued in 1957, just after the introduction of the 5200 series M-track. It must be stated that this system was beautiful and very realistic with its sleek switches and wide radius curves. The track pieces are far superior to the “M-track” and arguably, even to the “K-track”. In 1956 Märklin introduced the “M-track” system (M: Metall), which lasted until 2001. The track consisted of a metal roadbed with imprinted painted ties and studs protruding through the centre of the ties. Straight track pieces were 18 cm. long. 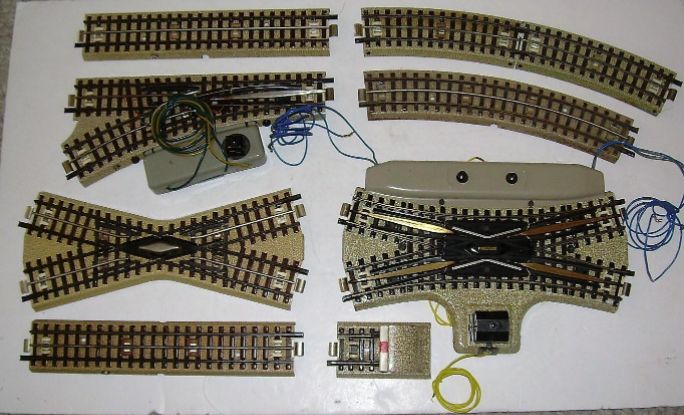 Curved track of three different radii was available, together with manual switches, electromagnetic switches of various curvatures, including a curved switch pair and a three-way switch and two different double slip switches. Although not the most realistic, the system was reliable and sturdy. It was much cheaper to produce than the 3900 series track. For the clockwork train, produced in 1953, a set of “M-track” without the stud-contact was available, which could later be adapted with the purchase of a center-stud rail for electric operation. Track included in Märklin’s “Primex”-line (a somewhat simplified product) can be identified by its uniform grey colour of the roadbed but is otherwise identical to the M-track system. In 1969 Märklin introduced the “K-track” system. K: “Kunststoff”, German for Plastic. Consequently the metal tracks were from that time onwards dubbed “M-track”: M for metal. 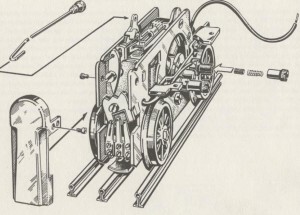 The K-track is essentially the same as the “Modell-gleiss” from the fifties: plastic ties and small stud contacts, but without the metal roadbed. Originally the series had hollow rails (2100 series), later solid nickel-silver rails (2200 series). The assortment expanded over the years with curved track of five different radii, sleek switches, cross-overs, double slip switches and even flex-track. The K-track system looks very realistic, but the delicate connections between the track pieces are easily bent or distorted, resulting in poor electrical contact, especially after several times of connecting and disconnecting. When Märklin introduced a “toy-train” for children in 1988 (the Alpha train), it included a new track system, the #2000 series track, with a plastic roadbed, which was finely detailed, easy to connect and reliable for the distribution of continuous power. This system resulted in the production of the so-called “C-track” (C: “click”, because the track pieces connect with a distinct click), which was further developed in 1996 with a wide assortment of various tracks, curves and realistic sleek switches. The system lends itself extremely well for operation with digital trains. The connections are secure, power supply in the system is continuous and electronics can be stored beneath the track. The track can also be used in two-rail DC operation because both outer rails can be insulated from each other. 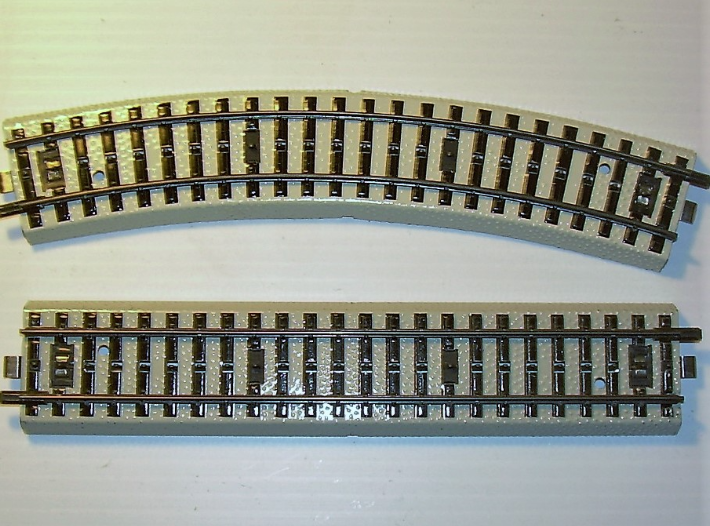 For those operators who wish to use the different track systems on their layout, Märklin made several adapter-track pieces available (from C- to K- or M-track, from K- to M-track). 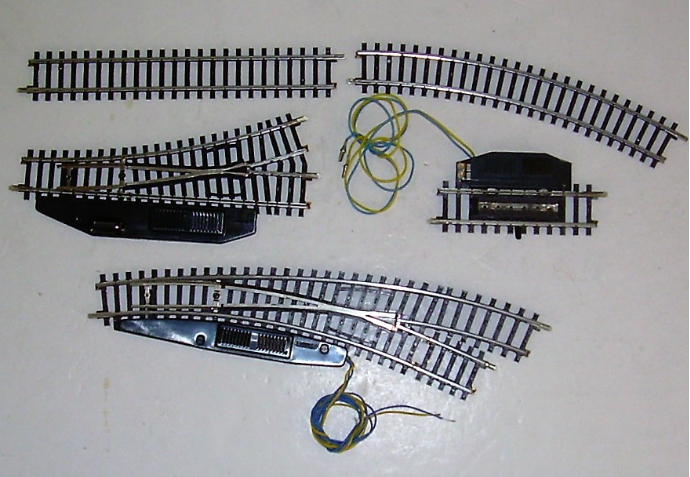 All metal track pieces (3600, Modell-gleiss, M-track) are fully interchangeable without the need for adapter track. Operators using the Märklin digital system can best rely on C-track. K-track can also be used as long as the electrical connections between track pieces are secure. M-track is not recommended for digital operation. Electricity had arrived in many households in the late 1800s. The electric power was distributed by many independent, often small, suppliers and varied from 220V, 110V alternating or direct current, to even three-phase current. Toy train manufacturers had to provide the necessary electric power for their engines. The electric motors for these engines were often rather large and cumbersome as the wiring for the field- and rotor magnets was cloth-insulted thin copper. Transformer techniques were still in their infancy. Needless to say all these factors posed significant problems for the manufacturers. This article discusses how Märklin dealt with such problems over the years, until the arrival of their 00 (later H0) system. The different power supplies for the track (batteries, transformers, rectifiers etc.) are not specifically discussed in this report. 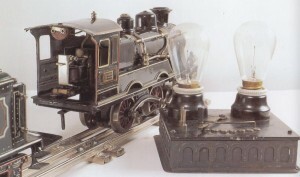 Märklin introduced its first clockwork locomotives as early as 1891 in gauge 1, after having taken over the Lutz Company. These locs had a simple clockwork mechanism. When wound, they shot forwards and immediately derailed on the sharply curved track. This could be prevented by hooking up some heavy cars. 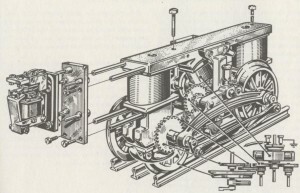 Märklin improved the spring-driven clockwork system in 1910 by adding an ingenious “brake-system”, a regulator built in with the loc, which consisted of a small cylinder or ring, containing spring-held brake-shoes pressing against the inside of the cylinder, which were gradually spring-released when the power of the mainspring decreased, thereby allowing the engine to run at approximately the same speed until the mainspring was unwound. The clockwork mechanism had become stronger, allowing for longer running-time. A special “Kraft-wagen” (power-car) was added for gauge 1 in 1909. This car could be run in the middle of longer trains and had its own clockwork to assist the locomotive in long, heavy hauls. There were even clockwork engines that had two clockwork motors, first built in 1909. In 1909 Märklin introduced clockwork engines in gauge 1 with headlights, the electric power was generated by means of a dynamo built into the engine. 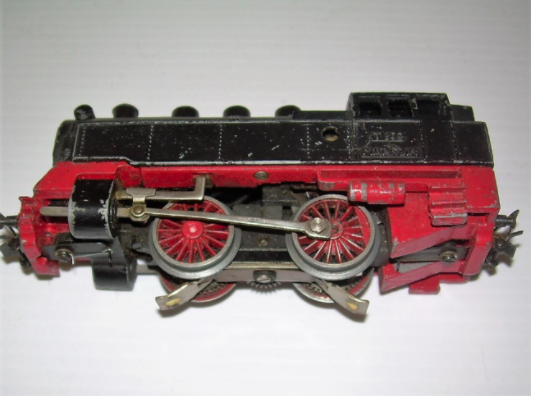 Märklin continued to produce clockwork engines until the very end of their gauge 0 assortment in 1954 with a simple 0-4-0 steam loc. 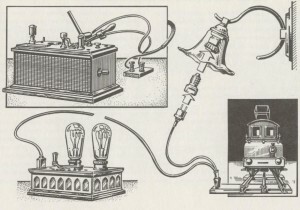 All other clockwork engines were taken off the production line around 1935 when electric engines and transformers were being built to perfection. The first live steam driven engines, built as early as 1895, were “dribblers” as they continuously leaked water vapor from their cylinders. Later engines had very sophisticated steam-engines as propulsion power, which were often heated by gas-burners. The engines were built for gauges 1 and 0. These beautiful models were produced until 1935 when electrical propulsion systems had become reliable and safe. Electrical power was not introduced in most households in Germany until the early part of the 20th Century. Even then, there was complete chaos in power supplied to the households as it was provided by many small independent suppliers, which supplied the households with 110V or 220V, AC or DC, or even 3-phase current. Electricity was introduced in Göppingen (where the Märklin factory was located) in 1900. It was not until 1926 that household voltage became regulated. For toy-train manufacturers this chaos posed significant challenges. Besides, the development of transformers was still in its infancy. 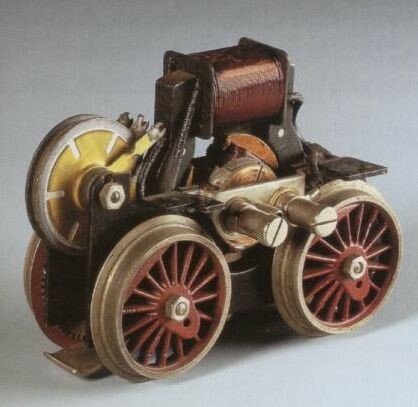 In addition, the development of electric motors for toy trains had its own problems. The copper wire used in the windings of field magnets and rotors had cloth winding as insulation. This resulted in rather large electric motors. 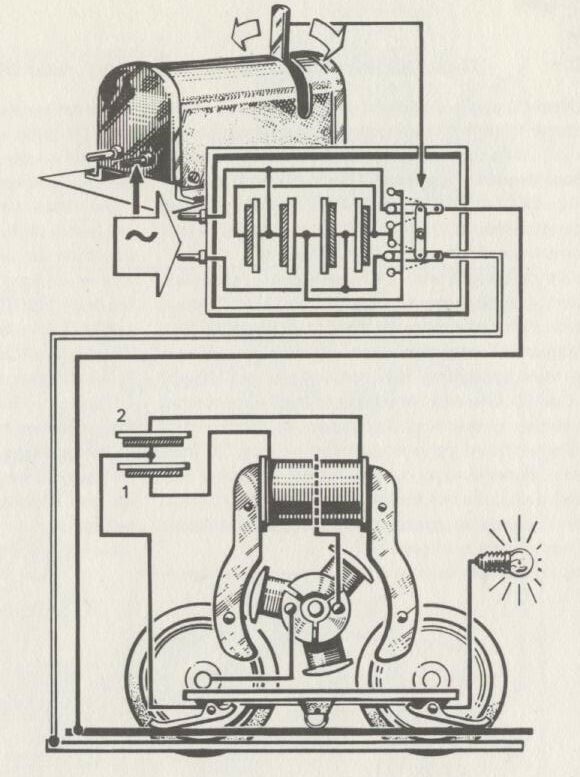 To further complicate the development of these motors, it was customary to use the shell of the clockwork engine to save on extra expense and to build the electric motor inside the available space. From the mid-thirties onward Märklin had developed good and reliable 20V transformers. For that reason the need for clockwork- and steam engines diminished and new engine models were mostly produced as electric engines only. Low current (4V DC) electric motors were used as engine power as early as 1900. These motors were powered by large batteries (“accu”), which was the only power readily available. They were used in gauge 1 and gauge 0 engines. The 4V DC motor with permanent magnet was compatible in space with clockwork motors. Replacement of the clockwork motor with an electric 4V motor was available! The advantage of these motors was of course the much longer running time of the engine, and the easy reversing by changing the polarity of the power. The disadvantage of these motors was the low pulling power, less so than the live steam or clockwork engine. In addition the power supply (battery) had a restricted lifespan. High voltage (“Starkstrom”) electric motors were installed in existing loc shells used for clockwork between 1904 and 1926. The size of these motors was dictated by the motor-frame distance (used for clockwork) in the existing engines. This was by no means an easy task as the available wiring of the field magnet and rotor consisted of thin copper wire covered in cloth wire for insulation, resulting in a rather voluminous motor. That meant some, often strange looking, adaptations in the engine to accommodate the larger electric motor. 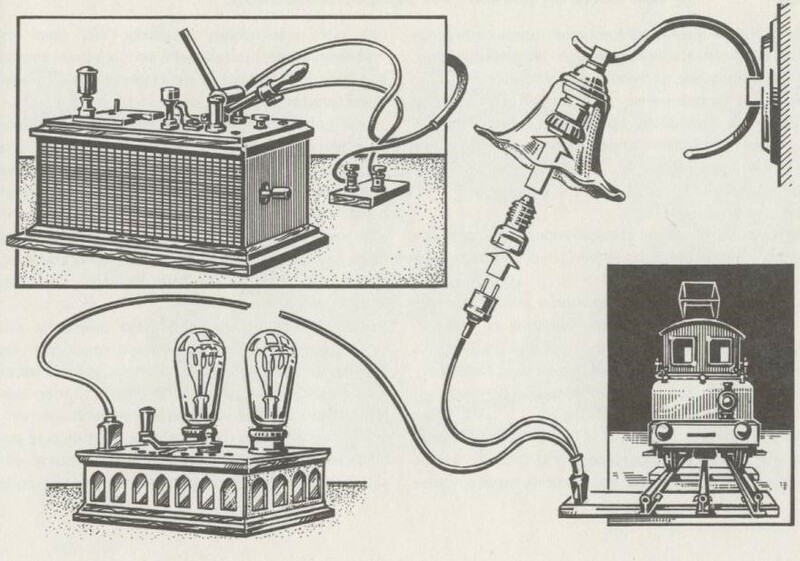 Electric power was derived from the existing 110 or 220V household current, with light bulbs to reduce the voltage to approximately 50V. When derailments occurred (or even when the power was turned off) the full 220V could be on the track. The newly formed Electrical Regulatory System (VDE) prohibited the use of these dangerous techniques in 1926. From that time onward the engines had only 20V AC or DC electric motors. 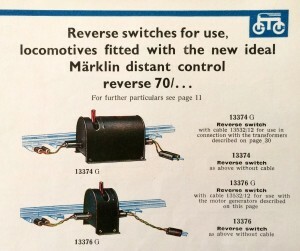 Märklin introduced their first 20V AC electric engines in 1927 with at first only a hand-reverse. Reversing for an AC motor is more complicated than for a DC motor. 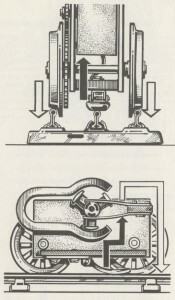 The reversing can only be accomplished through the rotor-brushes, not through the field magnet. Transformers were developed that reduced the current to a safe 20V. The 20V 0-gauge engines had mostly AC motors. These motors could run on either AC or DC power. 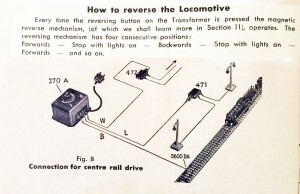 In order to change the direction of travel, the “66/-reversing unit” was developed. When the power was on, a secundary electromagnet pulled a metal finger down onto a toggle switch and the engine ran in one direction. When the power was off, the metal finger was released. When the power came on again, the metal finger was again pushed down and forced the toggle switch in the other direction. 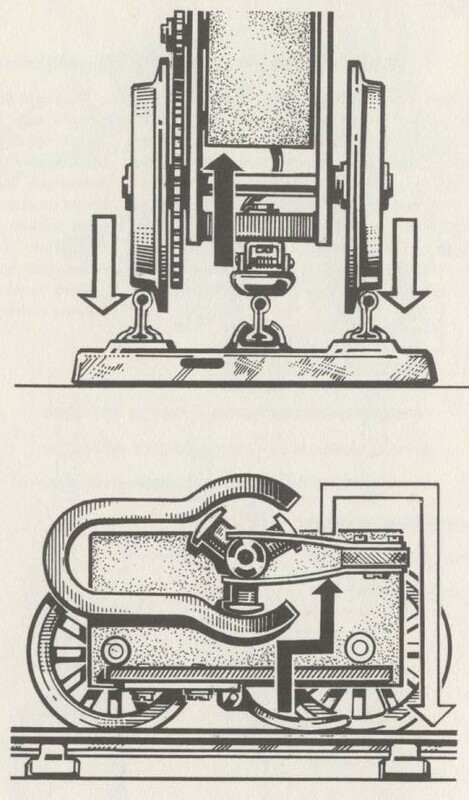 These switch-maneuvers reversed the flow of power to the brushes. The remote reversing unit could be deactivated by fastening the direction of travel with a reversing rod which protruded from the back of the engine. Märklin introduced a DC motor in their 0-gauge (and 00 gauge) engines in 1935. These engines had no hand-reversing lever. 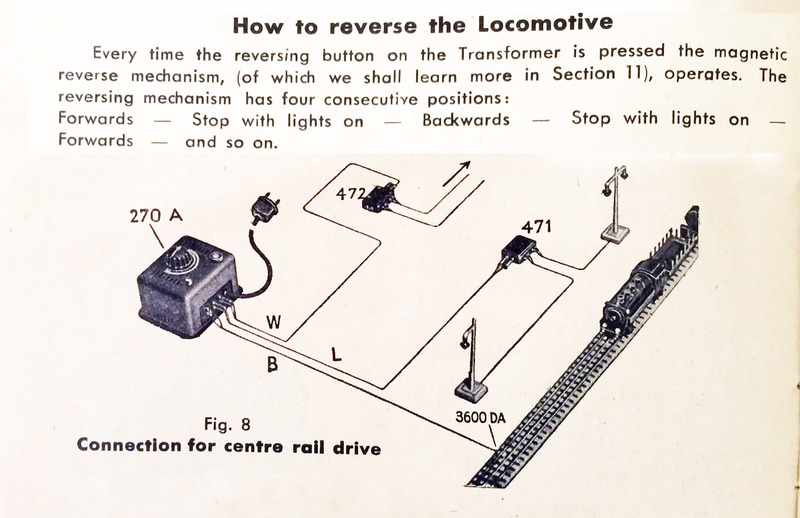 Reversing with the so-called “70/-reversing” (Ideal- or Perfect Schaltung) was accomplished with two rectifiers: one between the transformer and the track, the other rectifier was built into the engine. The quality of the rectifiers was not very high due to the use of poor materials, as higher quality material was needed for the WWII war effort and the rectifiers often started to smell. The competition mockingly referred to these rectifiers (in German: Gleichrichter) as “Gleich riecht er”, meaning “he smells right away”. Reversing of the AC motor in Märklin’s H0 gauge engines is accomplished by having two counter-wound windings in the field magnet. A separate reversing unit with a built-in electromagnet switches the power by means of a higher voltage burst which activates a finger to switch the power from one winding to the other, thereby reversing the direction of the engine (the Perfect-Schaltung 800). Further discussion on the engine power in Märklin’s H0 line is omitted in this report. Red flash: 20V AC. 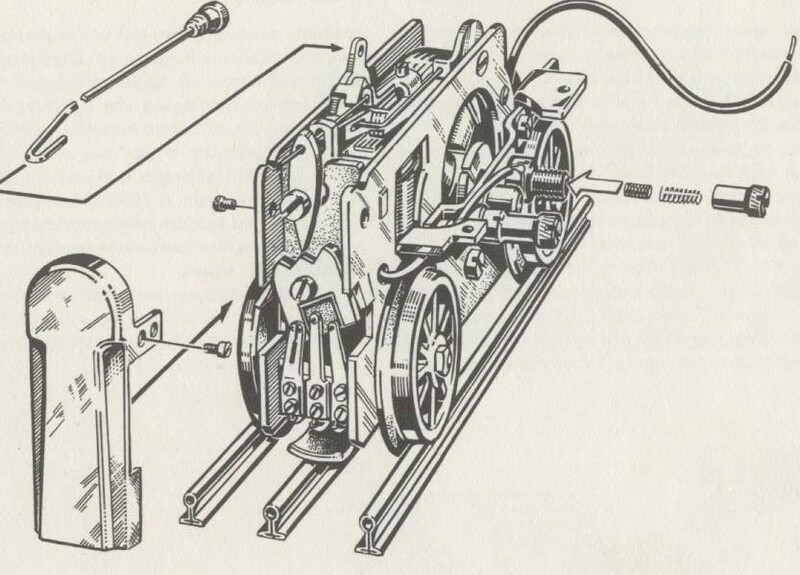 The engines were equipped with a reversing rod protruding from the back of the engine cab for manual reversing, used both in engines with the 66/ reversing and in engines without this remote reversing unit. Many engines from the 1930s have a small metal placard with “B” inscribed on the side of the cab. This “B” is a recommendation from Marklin of what transformer to use. A locomotive that has a “20 Volt B” placard can be run, for instance, with the 13470 B transformer. These engines had no manual reversing rod. Marsh, H. Carlson, P. Cristie’s toy trains. Watson –Guptill Publications, 2002. The founder of Märklin (also “Marklin” and “Maerklin” more commonly in the US) was Theodor Friedrich Wilhelm Märklin (1817-1866), a master tinsmith. He moved to the small southern German town of Göppingen with his second wife Caroline (his first wife had died) in 1856, where he purchased the “Resident-rights” from the city and was henceforth registered officially as a “tin-smith”. With Caroline he had 3 sons: Wilhem Friedrich, Carl Eugen and Carl Adolf. The firm “Wilhelm Märklin” was established in 1859. The main products consisted of dolls, kitchens, and similar accessories for girls. The firm was very successful and moved into a larger house. This house had a trapdoor into the cellar where the toys were produced. One evening an apprentice had not closed the trapdoor. Wilhelm did not see this and fell into the cellar and sustained broken ribs and other injuries. He died within a few days on December 20, 1866. This was a very difficult time for Caroline: she had 3 young sons (the youngest merely 6 months old) and a young daughter from a previous marriage. She undertook the difficult task as salesperson to promote and sell their articles to toy-shops everywhere in the country. She died in 1893, and the helm of the firm was taken over by her son Eugen and his brother Carl under the name of “Gebrüder Märkin” (Wilhelm Friedrich had moved to Alaska. He never saw his family again and died there in an old folks home). In 1891 Eugen bought the firm Ludwig Lutz, a firm which at that time produced the finest metal toys, including the first trains. The first O Gauge Märklin locomotive was produced in 1893 with a strong clockwork mechanism that when wound up several times, would send a single locomotive flying around the track enough times to make your head spin. 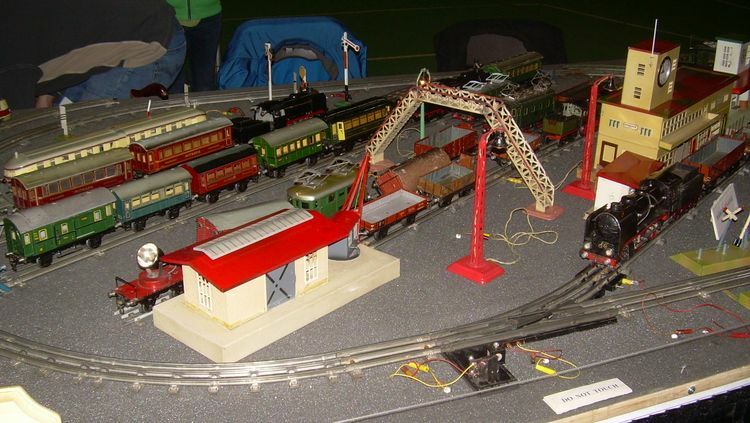 These O Gauge trains and subsequent standard gauges (O, I through V) were standardized by Märklin at the Leipzig Easter Fair where new innovations and produces were commonly first introduced. 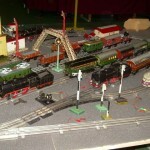 In the early part of the 20th century Märklin built metal toys, including miniature stoves that actually worked, steam ships with clockwork or real steam power, steam engines, toy guns (Germany was of course geared towards war for many years), clockwork cars that could be disassembled to be fitted with other types of car bodies, electric slot-car systems, metal tops, and other non-train related metal toys, including die-cast cars, not unlike Dinky. Märklin produced toys of every kind, some playful and others built for realism: from shooting games with clown characters to realistic fountains and fire trucks that pumped water through tiny rubber hoses. During the years 1909 to 1914, Märklin produced a two-gate cattle rampe Nr. 2552/0 in Gauge-O that featured a cattle shepherd, two working gates, and even a little ramp to load the sheep! During this first period of rapid expansion, Märklin solidified itself in the toy industry and built its name in international markets as a produce of fine metal toys. When looking across the entire span of Märklin production from its founding to today, Märklin during this period offered some of the most diverse and interesting products that were unfortunately discontinued in later decades. Such masterpieces took workers in the factories hours to meticulously build. Tin toys which represented a majority of the Märklin produce line during this period would begin as large sheets of tinplate which would be cut down to size using large presses and cutting dies. The next step would be to form these smaller cut sheets into desired shapes with some contour to them. This process was either done with a rubber hammer in hand or with a large die press. Tinplate sheets sandwiched between two large engraved plates would cut out window holes or doorways with force coming from both plates. After tin sheets were cut and formed to shape they would be soldered together by experience tinsmiths. Finally the painting phase would begin which perhaps required the most skill and attention to detail. An array of brilliant enamels would be applied to the tinplate and baked in an oven between coats to ensure the durability of the paint. Finally gold lining and finely detailed embellishments (such as painted rivets, destination signs, and flags) would be applied all by hand. Stamps and brass engraved name plates would be applied and the final produce sealed with a coat of varnish to ensure a brilliant finish that would last for decades (even centuries) to come. Surely pieces still existing today in excellent condition which were produced in this period are a testament to the skill of Märklin craftsmen. The firm was growing! Eugen Märklin had 9 children, amongst whom Fritz, who later took over the business, Richard, who headed the firm’s branch in the US and Willy, who even later took over the firm. Claudius Märklin, son of Willy, later became editor of the Märklin Magazin. The firm expanded to its current location on Stuttgarter Strasse in Goppingen in approximately 1907 and had around 700 employees according to a newspaper article. The factory and Märklin’s business remained relatively in tact during both World Wars despite considerable losses of employees to the war effort and a temporary shift in production to war materials. During World War 1, Märklin produced shell casings, belt buckles, and various other manufactured items which could be made relatively easily with the already present metal stamping equipment. The Second World War forced the Märklin factory to stop production in approximately 1945 to yet again produce items for the war effort including pressure sensitive detonators and small engines for torpedo propulsion. More can be read about Märklin during WWII in the episode EP #11 – Märklin during World War II. Other people that were important in the history of the firm include Richard Saft, whose command ot other languages helped in the export to foreign countries, and in post WW2 years Helmut Kilian and Otto Bang Kaupp who furter developed the H0 line. After the death of Fritz Märklin in 1961 the Märklin family was no longer represented in the firm after a period of 102 years. 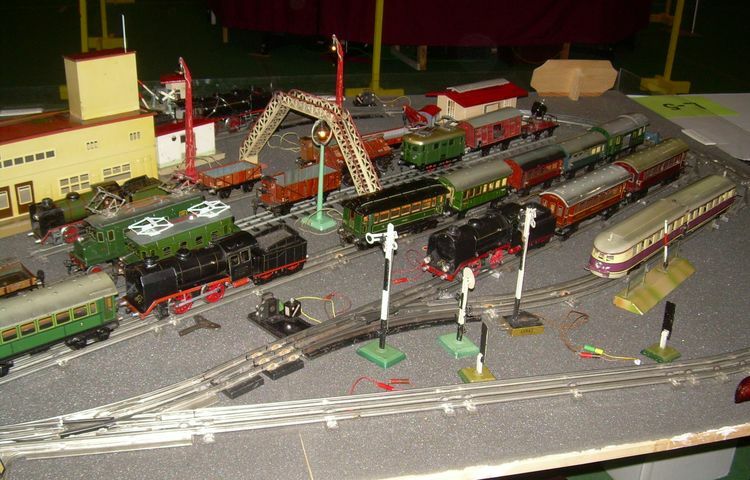 Of course Märklin toys circulated around the world during the very early years of production as Märklin was always known for its incredible quality, but the Golden Age period of Märklin brought many international importers of Märklin products. Märklin responded not only by supplying its toys to these importers in bulk but also by manufacturing toys and trains for specific markets. 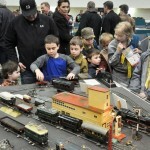 Toy enthusiasts of Great Britain enjoyed beautifully colored trains of the L.M.S, L.N.E.R, and G.N.W.R. railways and stations and platforms (many feet in length!) of all gauges delivered through distributors Gamages and W. Seeling of London. The American market was sustained by the flagship toy stores and distributers F.A.O. Schwarz in New York, Richard Maerklin Toys (see more EP #8 – Richard Maerklin Toys: A US Maerklin Legend), and Charles C. Merzbach in the late 40s and 50s. Toys for the American market not only had English lettering for signs and inscriptions but also featured cowcatchers instead of front buffers, bells, tunnel lights, and sometimes special paint schemes as was produced for Richard Maerklin Toys: a swiss crocodile CCS 66 12920 locomotive painted snow-white for the NEW YORK CENTRAL LINES and a French mountain locomotive ME 66 12920 painted apple-green. Political relations around the World War II era stunted the export production for Märklin which meant many planned models were never produced. However, the first customer catalog after the War featured in 1947 a series of 00 Scale wagons and locomotives produced specifically for the U.S. market including the ST 800 and DL 800 streamlined diesel-locomotives. In their assorment of trains, Märklin standardized several gauges. The first trains were “floor runners”. The first “system-railroad” was developed as early as 1891 by Märklin, and the firm was instrumental in developing a standard for trains and tracks, accepted by other toy train makers, a novelty in the toy-train world. Their Gauge 1 had its culmination in the famous “crocodil”, first built in 1933. This electric loc became soon the “flag-ship” of the firm, produced in the pre-war gauge 1 and 0, and in the post war gauges 00/H0, Z and 1. Gauge 0 started in 1896, and in the thirties this gauge became more popular than their gauge 1, which was abandoned in the mids thirties. All these trains, altough very realistic looking, were of course TOYS: the doors of the cars could be opened, signals and switches were often manually operated, and so on. Play-value was very important. Märklin experimented with a smaller gauge than 0 in the late 20s, which they called 00 “Liliput-Bahn”, scale 1:70, (roughly equivalent to S-gauge) with one wind-up steamloc, later augmented with an electric 4V steamloc. This experiment never came off the ground in significant numbers however. 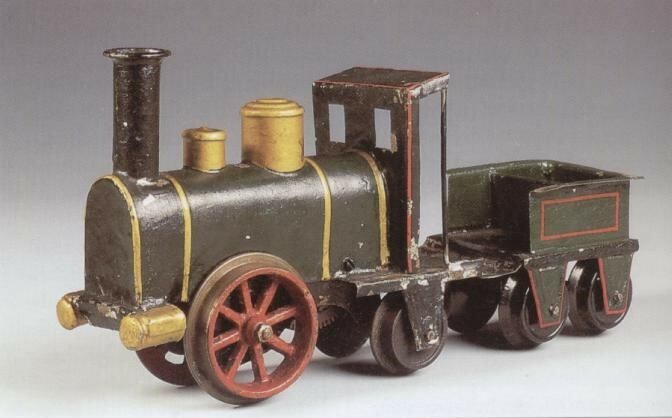 Even in the 30s a very detailed prototype steamloc was built for this scale but was never produced. It was not until 1935 that Märklin came out with their first mass produced 00 scale, later in approximately 1947, the scale was dubbed H0 (or half-0). 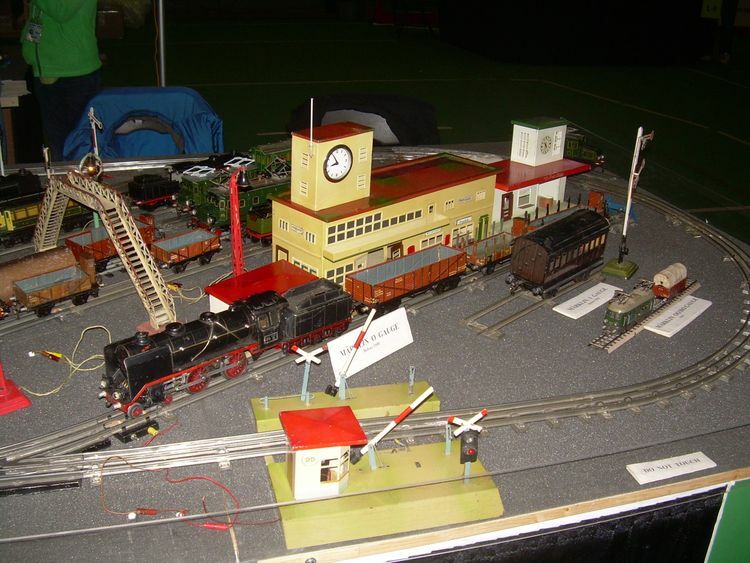 Trix, a competitor, was equally engaged in the early production of 00, and Marklin had to rush to present a display layout at the 1935 Leipzing spring toy fair to meet the competition. Märklin came out with a slew of 00 wagons and two electric locomotives: a steam 0-4-0 R 700 and an electric RS 700 of the same wheel arrangement (pictured right: top-to-bottom 1935 versions of RS 700 E-Lok, R 700 Steam, and 3600 AR regular track). 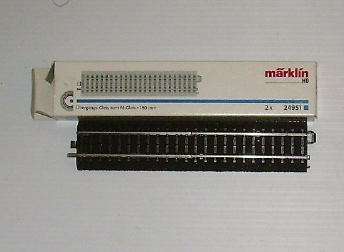 Märklin always maintained its historically grown three-rail AC operation, which is more reliable and electrically less complicated than two-rail DC. An exception to this was the “Hamo” line, which ran on 2rail DC. Marklin purchased the Hamo company that made H0 streetcars in the 1964 and equipped some of the Märklin train models with DC 2-rail motors. The production of 0 gauge trains was phased out after WW2 and stopped completely in 1956. After the war many people had moved into smaller houses where there was little place for an extensive 0-gauge layout. People had more leasure time available for hobbies. H0 trains had become mass produced, and with the introduction of plastic, products had become more readily available to lower income people. 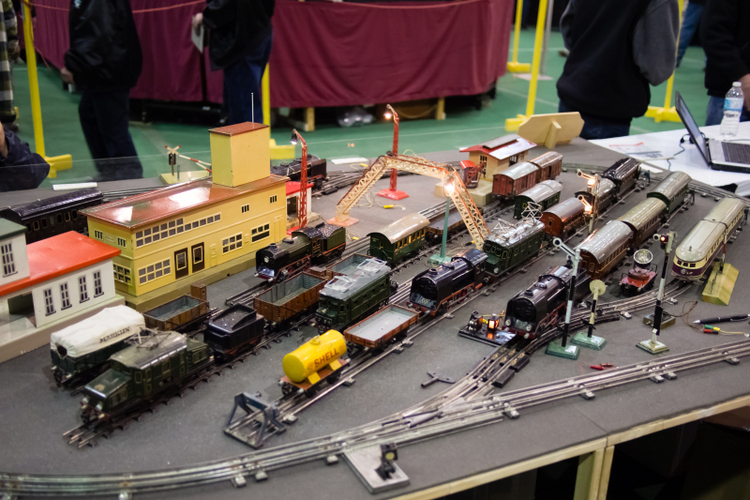 A smaller scale allowed for enthusiasts to build extensive layouts complete with buildings, track, small figures, and realistic trains in a relatively small space. 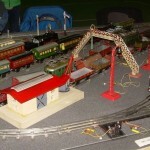 One must not forget that most Märklin products such as trains, steam engines, boats etc. were very expensive at the time and were mostly available only to the children of affluent families. In 1969 Märklin introduced the new gauge 1 system with DC current. 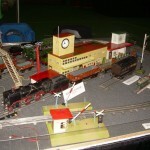 In 1970 Marklin re- introduced an 0 gauge train that ran on H0 track: an 0H0 train for children, the “Minex”. In 1972 the firm surprized the world with the production of the smallest system model railroad: The Z gauge. When Märklin introduced movement and motion to their toys, the excitement reached a whole new level of play-time entertainment. Toy trains in the late 1800s which moved by pulling a string attached to the front buffer were propelled down the tracks in the 1893 by clockwork motors and a little later by electric and steam ones. 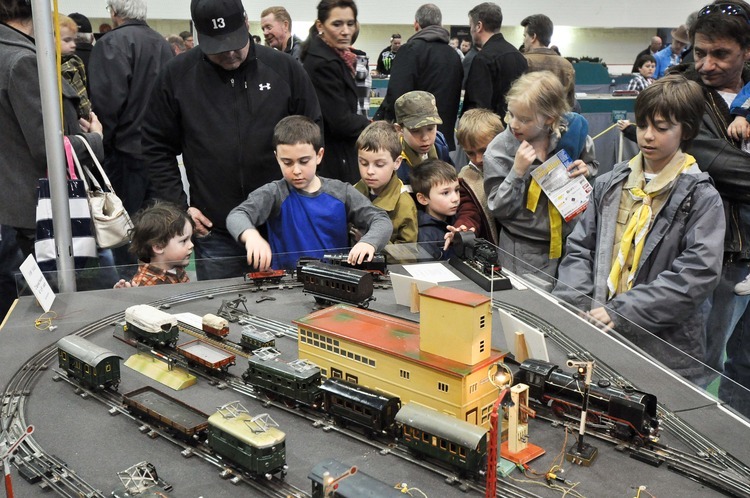 Today digital technologies allows precise control over toy locomotives and accessories that mimics the complexity and possibilities of a live railroad operation. 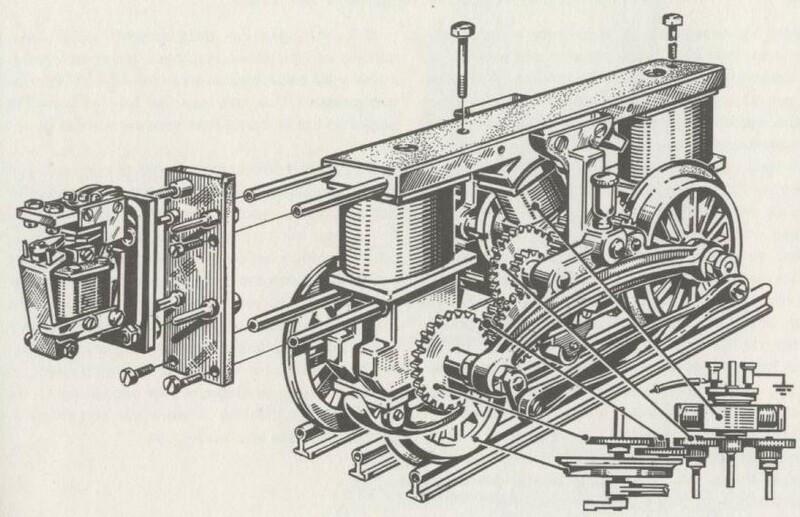 The development of a strong and compact clockwork motor which could be fitted inside a locomotive engine was a huge advancement in motive power. 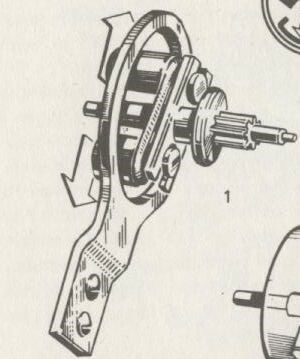 At first the motor was a bit primitive: when wound, the engine would shoot forward as the internal spring unwound, possibly derailing on the curves because of the high speeds. 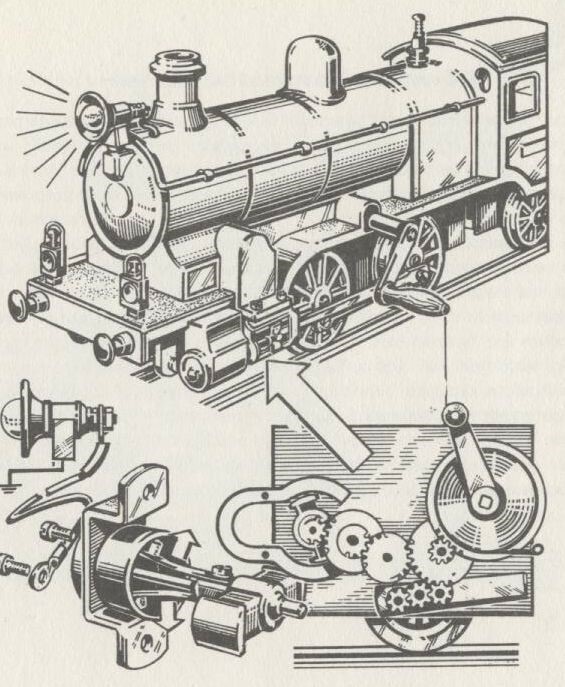 Although Märklin’s clockwork springs were known to be very efficient and could propel a train around a loop many times, a lot of winding was necessary and a train would be out of power in no time. A novelty was that Märklin offered electric trains as early as 1895. In those days few cities in Europe had electric power available, but it was present in the halls of Göppingen! Electric power for the locs was either through high voltage (220V, reduced to 50V by means of lightbulbs) or 4V DC (battery). Eventually the 50V system (“Starkstrom”) was prohibited by the government. At that time the low voltage transformer had become feasible and the less dangerous 20V systen became the main power for 0 and even 00, from 1926 on. Advertisements of the 20s and 30s lauded the safety and ease-of-use of electric current for toy operation which undoubtedly was much more safe than live steam or gas-powered operation! And of course the digital age took control of the power in the Märklin H0 trains as early as 1980 and used the pathways of electricity to control the digital functions of the trains and railways operations. Another form of power was of course live steam: this was available in the Gauge 1 and 0 steam engines. Live steam engines could be found in many Märklin products including locomotives, ships, stationary steam plants (which generated electricity to power lamps and accessories), and rolling tractors. Almost all products running off live steam were powered by an alcohol burner which heated a boiler tank filled with water. These toys were vary dangerous for small children because of the open flame to burn the boiling hot water. Such live steam products were often sold in sturdy wooden crates and were packed with various tools to assist with maintenance of the engine: a small bucket to fill the water reserve, a funnel to pour the water and alcohol, and various wrenches to adjust the pressure valves. Worth mentioning here is the compressed air that Märklin used in the 20s to operate signals and switches by means of thin rubber hoses. Toys for children, which had been Marklin’s main product from the inception of the firm, had by this time almost completely disappeared from their line. Children no longer played with the more sophisticated and delicate scale models: these were now sold to serious adult model railroaders. The era of toy trains for children to play with was over. Marklin recognised this waning market and made several attempts after the mid-fifties to rekindle the interest of children in trains and other toys, well expressed in many of their catalogues. Märklin also re-introduced a slotcar set in the early 70’s” Märklin Sprint”, and plastic building blocks not unlike Lego, the “Märklin Plus”. Marklin once more tried to capture the childrens market in the late 80s. This time the firm invited children to design their own “dream-train”, which resulted in the production of Marklin’s “Alpha adventure sets” in 1988. High-speed locomotives (an 0-6-0 with tender) and cars had a futuristic look, were equipped with the regular Marklin H0 couplers and ran on a new “three-rail” plastic-based track system, called the “2000 track”. The boxes in which the sets were sold could also be used to act as tunnels, mountains and other scenery. Cars could store futuristlic looking automobiles and trucks. These trains were indeed built for “high play” value. The system could be powered by rechargeable power units (which unfortunately did not function very well). The Alpha adventure sets were last seen in the 1995 catalogue. They were too expensive and did not sell as hoped for. However, the good news resulting from the Alpha sets was that Marklin developed the plastic base track system further into the “C-track”! 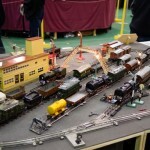 In recent years The Marklin production line offers trains only. 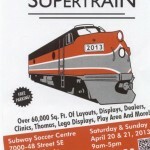 Three scales of trains are being produced: H0, 1 and Z. All other toys, once depicted in the early post war catalogues such as ,the Marklin construction sets (“Märklin Metall”), electric experiment sets (“Marklin Elex”), die cast cars, slot cars (“Marklin Sprint”) and even a Lego-like building blocks system (“Marklin Plus”) are no longer being offered. 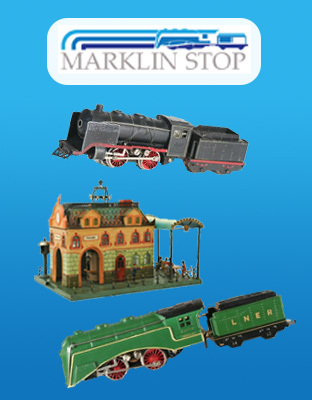 Once in a while Marklin produces nostalgic expensive replicas of their famous older toys, such as metal construction car and airplanes, a metal steam ship, a steam engine, a dolls pram and a carouyssel. These “toys” are meant for collectors only. The basic underlying message is that Marklin is no longer a maker of toys. Whether this is due to a changing world or to the vast array of different other, cheap mass produced toys available everywhere, is a matter of opinion. The firm had some of its glory-days in the mid to late 30s. During WW2 production of trains etc. had stopped and Märklin was involved in the war machine with the production of mine-detonators and a few other mechanical devices. The factory was spared from a bomb-attack on the nearby railway in 1944. 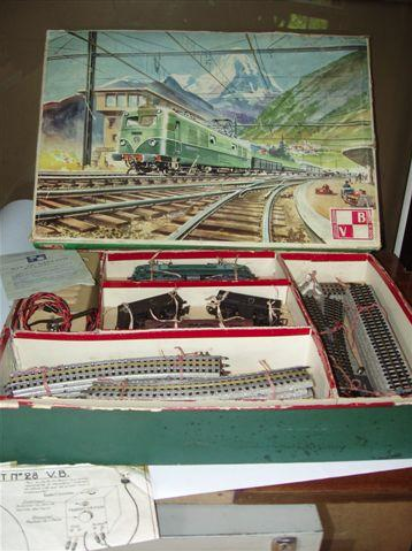 By the way, Hermann Goering was an avid Märklin enthusiast. He had an enormous 0 gauge Layout built in his estate, CarinHalle. The building was destroyed at the end of the war. No records remain of the collection other than in a few pictures. In the post war years the firm established itself once again as maker of high quality model trains and went through a period of growth and success (in 1959 the company had 2000 employees). Märklin trains were considerd the “cadillac”in the model train world for eye to detail, reliablility and quality. Financial troubles started around the turn of the 21st century and around 2010 Märklin had to file for bankruptsy protection. It went through a series of staff reductions and the firm seems to have established itself once again, with this difference that numerous components and possibly complete trains are now……..”made in China” (like the famous German Leitz microscopes!). 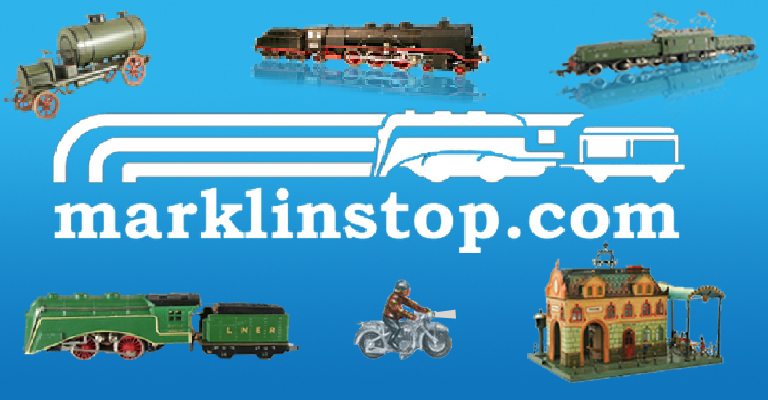 With just over 150 years in existence, the firm Märklin has earned a reputation for top quality toys and model trains. The genuine toys have by now disappeared from their line of products. 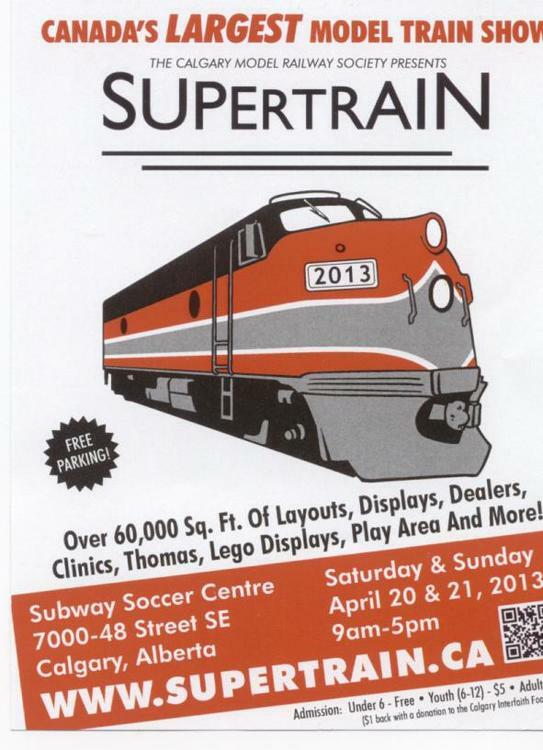 Arguably the firm is no longer a leader in fine model railroads, but is still an active producer. They have taken over Trix and even more recently LGB. Märklin trains are being avidly collected: Old gauge 1 trains and larger gauges have become very expensive and rare. Gauge 0 is also becoming expensive and even the 00/H0 trains from the 40s and 50s have soared in value. For years, auction houses like Sotheby’s and Christies refused to handle these old trains: they were not “antique”. In more recent years however these auctioneers have a steady stream of valuable Märklin (and other) toy trains in their “toy-auctions”. The trains were always expensive new, and even now the old trains are very expensive. Several books have been published (mostly by German authors) on antique toy trains, and more specifically on Märkln. These books offer a wealth of information.